I've talked before about team-up records and the very delicate balance that so many have to take. Ideally you want a synthesis, where everything comes together into one glorious whole that leverages the strengths of all three acts while minimizing the weaknesses. And let me stress how rare it is this actually works - more often than not one artist overshadows the other or they don't have chemistry or the entire experiment ends up being less than the sum of its parts. That's when you have two artists - it gets even more complex when you have three, and yet enter case/lang/veirs. 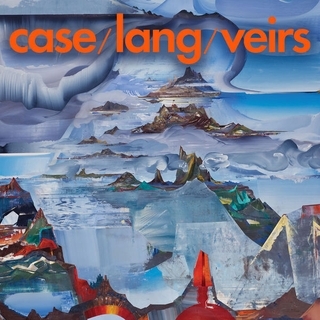 For those who are confused, case/lang/veirs is a concatenation of three artists' last names, all three female singer-songwriters who have amassed a pretty amount of critical acclaim: k.d. lang, Neko Case, and Laura Veirs. If you're only familiar with the mainstream, the name you probably recognize the most is k.d. lang and her signature song 'Constant Craving' as a part of the mini-wave of Canadian female singer-songwriters that got big in the 90s like Alanis Morrissette. Now if your frame of reference for female Canadian indie songwriters skews a little later, you probably recognize Neko Case, member of the New Pornographers and critically acclaimed in her own right. The last artist you probably don't know as well unless you know your underground indie folk, but Laura Veirs has actually worked with Neko Case in the past, and she also put out a stream of well-received singer-songwriter records in the 2000s. Now keep in mind that all of these women come from very different sides of indie rock and folk: Neko Case has always been on the rougher side of alternative country and Americana, k.d. lang started in a similar area but has also made pop and even collaborated with Tony Bennett, and Laura Veirs plays more to the ramshackle, smoked out ethereal side of folk rock that guarantees I'll be digging through her discography with rabid abandon the second I get some spare time. With all of that in mind, though, I can see the intersection point and why they'd want to work together, so what does this collaboration give us? Honestly, it gave me more than I ever could have expected. This was a big surprise for me, because while this album has been on near-constant repeat for the past couple of days for me, it's not a record that immediately jumped out at me as something I thought I would love. Part of this is scale - the record is fourteen tracks, clocking comfortably around forty-five minutes, and while this record can develop some bombast, it's clear the intentions were more reserved, more focused on refinement rather than some grand thematic conceit. And yet that refinement paid off in spades, because this album is gorgeously composed, beautifully performed, and exquisitely written, a sleeper hit to be sure but easily one of the best albums this year. I slept on this release for far too long, but man, I'm glad I finally took the time to really dig into it. So let's start with the big question of balance, because all three of these women don't just have distinctive voices, but iconic sounds as well, and while they all contribute to each song, you can tell there are certain songs that bear the mark of one singer over the other two. k.d. lang's songs are more smoky and jazz-inspired, Neko Case digs more into the alt-country side, and Laura Veirs makes the sort of ethereal and absolutely wonderful indie folk that I'd argue takes the most chances - in other words, very much in their respective comfort zones with a richer set of harmonies and more elaborate production. But that's far from a bad thing, because you can tell they're working to come together in the middle and the vocal arrangements are absolutely incredible. It's genuinely startling how much chemistry they all have, even on tracks like 'Georgia Stars' where it goes lo-fi in the vocal pickup. I do wish they took more advantage of the multiple singers to trade off more lines or play off each other in the songwriting beyond just the excellent opener 'Atomic Number', but I'd say that about any collaboration. But it helps a tremendous amount that the production and instrumentation is great enough to back them all up, full of liquid electric guitars, brittle acoustic grooves, rich strings section, tempered percussion, and such tightly woven melodic interplay with the pianos that it's honestly a little startling how many fantastic hooks they wring out of it. This production is lush and warm, touched by just enough reverb to give the mix depth but never feeling cavernous or swamping out any of their voices, and while I can see some wishing there was a little more of an edge - mostly because 'Georgia Stars' has the sort of compelling bite that makes you wish for it - I was plenty satisfied with how organic and fully formed these songs became. k.d. lang tends to take the lead on the most elegant and composed pieces with the jazzier touches like 'Honey And Smoke', that earthy low tone on the guitar on the torch song 'Blues Fires', or the slightly too stiff '1000 Miles Away', where I appreciated the ideas in the song but wasn't wild about the melodic tone. Neko Case tends to play a little rougher, with the acoustic brittleness paired against the cello on 'Song For Judee', the more striking alt-country feel of 'Delirium' with a hook that'll lodge in your head, especially with those bells, the more ominous bass textures on 'Supermoon', and especially the dark smoke of 'Down I-5' with a fantastic piano interlude. But the artist who showed the most diversity and intrigued me the most was easily Laura Veirs, from the bubbly head rush on 'Best Kept Secret' that's borderline twee with the horns but makes it work, the misty layered harmonies and strings on 'Greens Of June' that has an odd sexiness to the track that's really potent, the darker distorted autoharp backdrop of 'I Want To Be Here' that has that sweet jagged guitar, and especially that ragged rough-edged sound of 'Georgia Stars'. This is an album that has real instrumental diversity, but also feels wonderfully cohesive, and when you consider how many of these hooks are so good, it makes for an incredibly easy listen. But fine, what about the writing, because there's a part of me that's going over this record and highlighting how it doesn't really have a unified theme or idea. And on some level I would agree - these songs aren't so much looking to drive a narrative so much as they are capturing snippets of heartfelt emotion, with the situation tempered by enough maturity to lend self-awareness but still feeling earnest, which works to great effect on 'Delirium' and 'Best Kept Secret', the latter of which is a tribute to Veirs' guitarist and has that friendly camaraderie. But the writing tends to lend these songs gravitas to temper wilder emotions, like on 'Behind The Armory', where the narrator has her own emotional shields developed through circumstance, but she's looking for someone who can love her despite it. Or take 'Greens Of June', where every mundane detail seems sharper as love has pulled her back from the brink, or 'Georgia Stars', a song written from the perspective of a ghost reminiscing on half-forgotten loves separated by life and death. That distance is a pretty consistent motif across chunks of this record, from k.d. lang observing a lover fawned over by the masses on 'Honey And Smoke' to the heartbreaking emotional distance of 'Blue Fires' and '1000 Miles Away', where sometimes you can be in the same room and yet feel so far away from them. And that's not counting a song like 'Supermoon', which takes metaphors about venture capitalism and reframes them in terms of a relationship where both partners are strip-mining the connection for any emotion, a genuinely bleak track, or the fights of 'Why Do We Fight', only providing more truth how the people we have the capacity to hurt the most are those we love. But what I really love is how that tempering maturity is often seen as a strength to deepen the emotions, not detract from them: 'Atomic Number' laments a loss of purity but shows how that deeper emotional connection can transcend it. 'Song For Judee' goes even darker, written about a singer-songwriter in the 70s who never quite made it big and died of an overdose, but captures enough of the vibrant spirit to keep trying for that connection and make the tragedy go down easier. Hell, when you have songs like 'I Want To Be Here' as a tribute to the struggling artist or 'Down I-5', describing the road on the west coast that links the homes all three singers, you come to realize that connection is paramount, be it between lovers or artists, stretching across barriers of emotion, distance, or even beyond the grave. So yeah, perhaps a theme that can feel a tad broad, but the stories are well-written and framed enough to pull you in regardless, and that's what happened for me with this album. I don't know if this is simply a one-off collaboration, but Neko Case, Laura Veirs, and k.d. lang delivered something incredibly special with this record, an album that is certainly is subtle but is gorgeous enough in its simplicity to keep pulling me in for more. For me, it's a 9/10 and absolutely a recommendation if you're looking for some of the most gorgeous and excellently composed and produced music you'll hear this year. This is the best sort of collaboration, folks, and even if you're not huge into folk music, you have to check this out - you won't regret it.